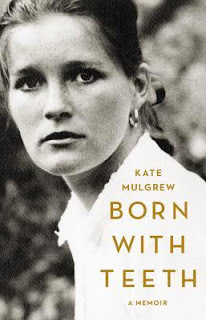 I downloaded Kate Mulgrew's "Born with Teeth" from Overdrive, expecting a typical celebrity's memoir - a romp through her exciting career. And let me be clear, Mulgrew's career is fascinating. She left NYU after only one year to pursue a role on the soap opera "Ryan's Hope," had a "Columbo" spin-off created especially for her, starred as the first female captain on "Star Trek: Voyager" and continues to act as Red on "Orange is the New Black." Amid her TV success, she has also acted in many stage productions. Yet, what I got was something much, much more. Mulgrew lays bare her personal life in her memoir, allowing a level of access that I haven't before seen in a celebrity's memoir. For example, Felicia Day was incredibly honest when describing her personal mental health struggles, but throughout the novel she refers to her boyfriend, without name, only a handful of time. She kept the lens tightly on herself, as is entirely her right. In contrast, Mulgrew throws open the curtains on her personal life, naming several of her past lovers (to be fair, these were likely already public knowledge), and describing in intense detail, her feelings and passions surrounding her relationships. She admits to being a passionate woman and is unashamed of this aspect of her personality and the relationships it has forged and shaped. As a result of the depth of emotion Mulgrew reveals, her memoir reads like a novel. We're given a first-person perspective of her journey through life, love, and career. Readers share in her joy and heartbreak because of the access we are given to her innermost thoughts and feelings. Mulgrew made headlines with the revelation that she gave up a daughter for adoption at the beginning of her career, and we see their reunion. We see her sons' difficulties with their parents' divorce, and Mulgrew struggle to balance her own romantic relationships with her responsibilities to her children. She even discusses, albeit briefly, the unique difficulties faced by female actors who also have responsibilities to their families, often unshared or underappreciated by their male colleagues. Mulgrew's honesty and passion may be too much for some readers, especially those of more traditional sensibilities. Yet, I was enthralled by her memoir and greatly appreciated the access she has permitted readers into her personal life. She narrates the audiobook herself, adding to the intimacy of the reading experience. Verdict: Affirmed, for fans of Mulgrew, or those looking for a memoir of a strong, trailblazing woman who is in touch with her passions and unafraid to share them. A quick note though, the memoir ends many years before "Orange is the New Black," so if you're looking for a discussion of her work there, this isn't for you. "Born with Teeth," written and narrated by Kate Mulgrew, published April 14, 2015 by Little, Brown and Company.